The official opposition to Initiative Petition 22 launched Friday - the same day petitioners submitted more than 110,000 signatures to land the measure on the Nov. 6 ballot. An initiative to repeal Oregon's sanctuary law appears likely to go before voters on the Nov. 6 statewide ballot. Petitioners for Initiative Petition 22 have submitted 110,445 signatures to the Oregon Secretary of State's Office, said Cynthia Kendoll, president of Oregonians for Immigration Reform, who led the signature-gathering. Only 88,184 of those need to be verified to land the measure on the ballot. The state's 31-year-old sanctuary law, passed July 7, 1987, prohibits the use of state and local resources to enforce federal immigration law when a person's only crime is being in the country illegally. The campaign for IP 22 asserts that unauthorized immigrants cannot live in the country without breaking other laws, such as acquiring a fraudulent identity or driving without insurance. 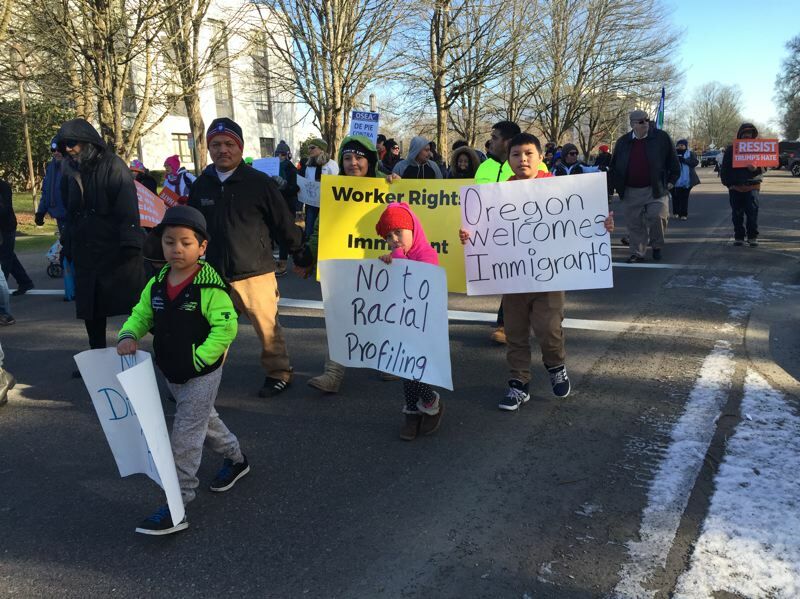 They argue too many of the state's resources are used to support unauthorized immigrants at the expense of Oregonians. "They have to continue breaking laws to perpetrate the law they broke by coming here," Kendoll said. "They have gone on to commit other crimes to shield the fact that they came here illegally." Opponents of the initiative on Friday launched their official "no" campaign — Oregonians United Against Profiling Campaign and planned to hold news conferences around the state on Monday to publicized it, said Andrea Williams, executive director of Causa, a statewide immigrants rights organization. "Republicans and Democrats came together in 1987 to pass this law for a really important reason — unfair racial profiling in our state — and to ensure local police are focused on local communities and not focused on the job of the federal government," Williams said. The official opposition campaign includes a coalition of about 80 businesses, including Nike and Columbia Sportswear, and other organizations, she said. "We believe Oregon's existing sanctuary law has been working as intended for over three decades in giving clear guidance to law enforcement officials on complicated immigration issues," she said. State Sen. Michael Dembrow, D-Portland, said the state's sanctuary law is essential until the federal government passes comprehensive immigration reform. Dembrow serves on the National Conference of State Legislatures' bipartisan Task Force on Immigration and the States. The 30-member task force unanimously supports comprehensive federal immigration reform, he said. "We all believe there needs to be a federal solution," Dembrow said. "Until there is one, we need to make do with the currently reality, and we need people who are here as documented immigrants or undocumented immigrants to feel confident that their neighbors are supporting them: If they have to call the police or have to go to court for whatever reason, they don't have to worry about state law enforcement turning them in." The ability to report crimes without repercussions because of their immigration status makes everyone in Oregon safer, he argued. National studies, including one report from the National Academy of Sciences, concluded that employment rate for immigrants is higher than for the general U.S. population and have lower rates of arrest, conviction and incarceration. The report also found that immigrants and refugees are not taking jobs from U.S.-born Americans: They are taking jobs that native-born residents either don't want or are unqualified to perform. Kendoll said she supports legal immigrants to the United States and that the initiative petition is designed only to address those who come to the country without authorization. "I want people to come through the door with our permission, not sneak over the border or overstay their visa," she said. "Our country should be looking out first for our citizens, our elderly, our children, our veterans and our disabled. Should we be taking care of those people first or people who are breaking our laws and getting ahead of people who deserve those services?"